There was a coating of snow on the lawn this morning. 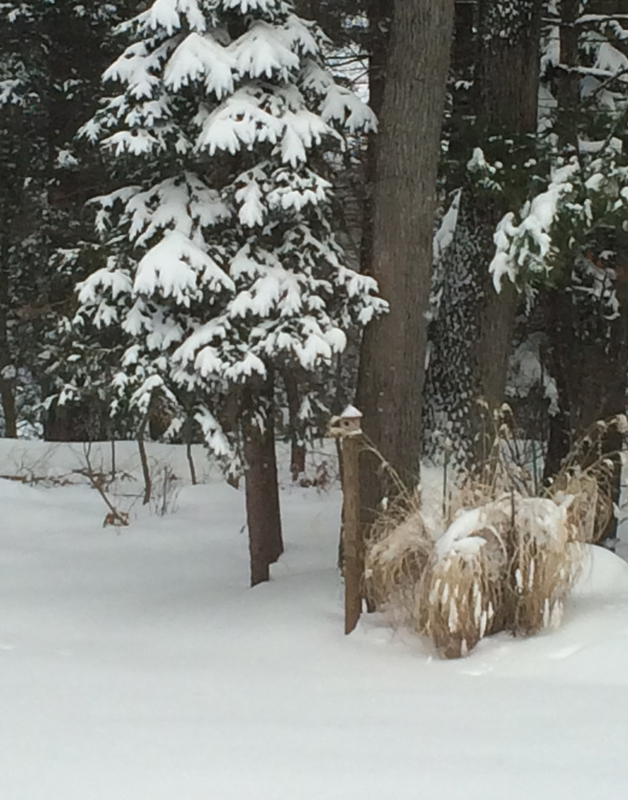 Lately it's been warm, so most of the piles of the white stuff have disappeared. That is unless you look at the piles of snow left by snow plows in parking lots. That takes a long time to melt. It is a pretty sight looking out a window and see snow on tree branches. About 2 weeks ago when the outdoor temperatures were a bit chillier, I baked a Ham. That may happen about once every 2 years. 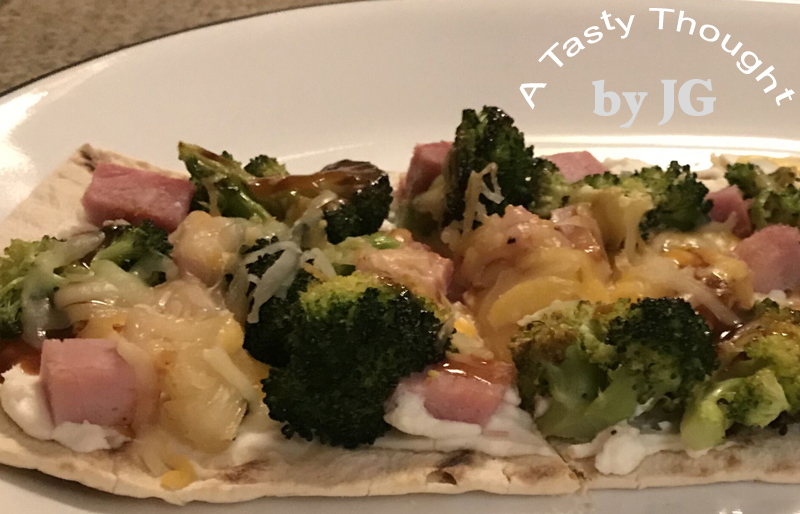 Two nights later we enjoyed Hawaiian Flatbread at dinnertime! The combination of the sweet pieces of roasted Pineapple with chunks of Ham was so good. The creamy texture of the Ricotta Cheese and roasted Broccoli florets added to the delicious flavor. It was also quite filling! Before putting the flatbreads in the oven, the Pineapple and Broccoli florets were roasted. I roasted them, because the fresh veggie was crispy and the Pineapple was very juicy. That just would not work well considering the short amount of time a Flatbread is baked. Roasting took out the excess juice and the broccoli was tender. Rinse Broccoli under cool running water. Pat dry. Cut off stalks, so small florets remain. If needed, cut smaller. Drain about 1/2 Cup canned Pineapple chunks. Coat florets and chunks with Olive Oil for sauteing & baking along with a 2 shakes of Basil & also Oregano. That's when I visit my Spice Rack. I place the Olive Oil & dried herbs in a Ziploc Gallon Bag and add the veggies/ fruit to coat. Roast in a 450°F oven for 11 Minutes. Place 3 Flatbreads on a large cookie pan. Prick with fork. Bake in 375°F oven for 2 Minutes. Remove from oven. Spread about 1/2 Cup Ricotta Cheese on each Flatbread. Place Roasted Broccoli and Pineapple on each Flatbread. In a small cup combine BBQ Sauce + Water. Cut each Flatbread on a diagonal- into 3 pieces. Hawaiian Flatbread is just so delicious!!! If you do have any chunks of Baked Ham in your fridge, use them while preparing flatbread for dinner. It is just so good! A few months ago I tasted Cinnamon Chip Bread. The name sounds interesting and let me tell you each bite of this bread was just... delicious. The Cinnamon Chips have that bit of pizzazz whenever your taste buds discover even a bit of one chip! I had read recipes that contained this "mystery" ingredient, but had never been able to purchase a bag in the grocery stores. Well, that changed! Yes!! Woohoo!!! I could not wait to bake a goodie using them. This led to an old recipe I posted years ago, Banana Crumb Muffins. I used the batter recipe for this Cinnamon Chip variety. **There was no need to make a "crumb topping" here, so I did not. However, I did sprinkle a small amount of granulated Sugar on top of each muffin before baking. The batter for the muffins was prepared with the addition of 2 Tablespoons of Cinnamon Chips. I did not want to overwhelm my recipe, so I used this small amount. When putting the batter in the muffin liners, there were plenty of chips for each muffin. 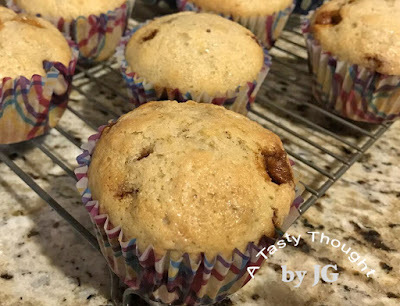 While these muffins were baking, my entire home smelled Cinnamon! Yum! These muffins are so good! I did learn that they do not freeze well. That's no problem, because 12 muffins do not last long. Combine Flour, Sugar, Baking Soda, Baking Powder and Salt in large mixing bowl. Add 2 Tablespoons Cinnamon Chips. In another bowl mash the 2 Bananas. Add 2 Egg Whites and beat mixture with a whisk. Add Olive Oil + Milk to Banana/ Egg Whites mixture and whisk together. Spoon batter into the 12 muffin liners. **Optional: Sprinkle a small amount of sugar on top of each muffin. Bake in a preheated 375°F oven for 18- 20 Minutes or until cake tester comes out clean. Remove from pan & cool on wire rack. Cinnamon Chips are a new ingredient to me, but one I will always keep in my pantry from here on! Amazing how much pizzazz these Banana Cinnamon Chip Muffins have.